This post is co-authored with Rory Conway, Product Manager, Teradata on Azure. The enterprise-class capabilities of Teradata Database have been enhanced for Microsoft Azure Marketplace. This is great news for organizations using, or wanting to try, Teradata Database as their engine for advanced analytics to deliver optimal business outcomes for areas such as customer experience, risk mitigation, asset optimization, finance transformation, product innovation, and operational excellence. Coupled with the recent launch of Teradata Demand Chain Management on Azure, these are substantial improvements that yield an impressive solution set worthy of your attention. Try it for yourself. As you may already know, Teradata Corporation has long been regarded as the market’s leading data warehouse provider for analytics at scale. With more than $2B in revenue from over 1,400 customers and powered by 10,000 employees, Teradata has the deep roots and technical strength that large organizations seek when aligning with a strategic partner. Teradata’s reputation is based on analytic performance at scale. The company’s deployment strategy is centered on hybrid cloud and license portability – “Teradata Everywhere™” – which make it easier for customers to buy Teradata in smaller increments and grow consumption as needed, where needed. Teradata’s market research predicts that more than 90 percent of companies will employ a mix of on-premises and cloud resources by 2020. As such, Teradata emphasizes software consistency across all its deployment options aided by a strong bench of services experts helping organizations evolve to hybrid architectures and derive the most value from their analytic investments. 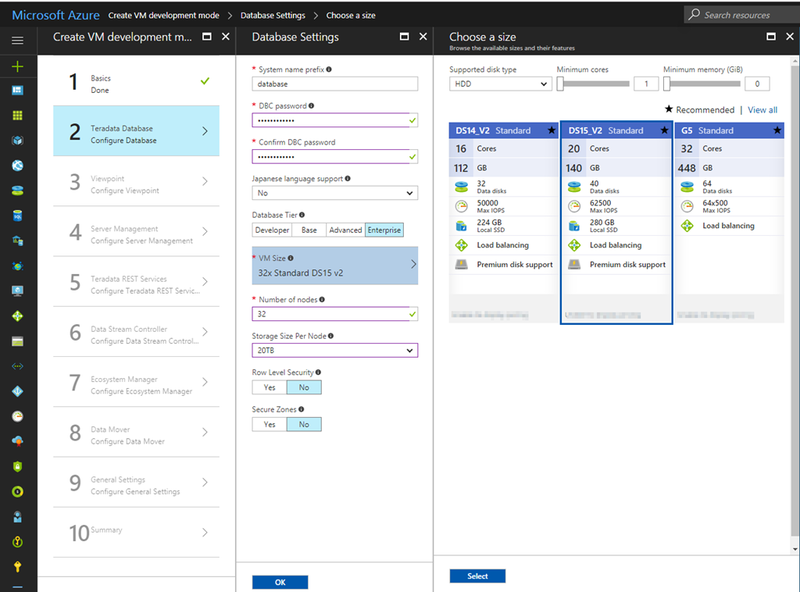 Azure deployment is offered on multiple Virtual Machine (VM) types available in nearly every region globally, including DS15_v2 and DS14_v2 (Azure premium storage) and G5 and D15_v2 (local storage). There are also other analytical ecosystem components available, such as Teradata QueryGrid which enables you to pull and combine insights from multiple data repositories. The table below shows the currently available options. Please see Teradata’s website for the latest configurations and software pricing. It’s no secret that many companies, particularly in retail and consumer goods, have aligned themselves with Azure as their public cloud provider of choice. An additional software as a service (SaaS) option from Teradata for the retail and consumer goods segments is Teradata Demand Chain Management (DCM), an application suite that provides forecasting, fulfillment, and demand chain analytics. Teradata DCM employs consumer demand data to develop daily and/or weekly sales forecasts of each item in multiple store locations based on historical performance with seasonal and causal identification. The forecast is then combined with inventory and fulfillment strategies which pull inventory through your supply chain based on expected sales across each location. The result is a reversal in the traditional supply chain flow of information, allowing store and SKU-level demand to serve its proper role at the peak of the pyramid. Teradata brings powerful analytic capabilities to the Azure community. For existing Teradata customers, consistent software in Azure means that you can leverage investments you’ve already made. For anyone else, trying Teradata on Azure is an easy, low-risk way to determine whether it’s right for you. Try it today by deploying Teradata from Azure Marketplace. To be secure-by-default, Teradata deployment does not automatically create public IP addresses for the VMs. After deployment, you can access the Teradata VMs from either a jumpbox VM that you already have in the same Virtual Network, via VPN/ExpressRoute, or by manually associating public IP addresses and specific Network Security Groups to the VMs you need to access such as Viewpoint, Data Mover, Data Stream Controller, Ecosystem Manager, or Server Management. For additional information, see the Teradata on Azure Getting Started Guide.